Plumbed Down: Losing a Decade: What Happened to My Life? Losing a Decade: What Happened to My Life? "For some reason I can only remember the live-action Mr. Magoo with Walter Matthau's from about six years ago," I recently said to an esteemed history teacher colleague who had referenced Jim Backus (the original Magoo voice and Gilligan's Island actor). Never mind the fact that it was Leslie Nielsen, and not Matthau, who was in that forgettable movie. "Are you sure it was six years ago? Matthau has been dead a lot longer than that?..." the history buff replied. (Matthau died in 2000, Nielsen in 2010). I looked it up. 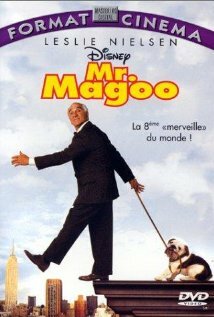 1997 was when Disney's ill received version of Mr. Magoo was released. 16 years ago! Exactly the same time I've been out of high school. I was off by a decade. As a history major, one who prides himself on remembering how chronologically the world has been chugging along, I committed a cardinal sin. 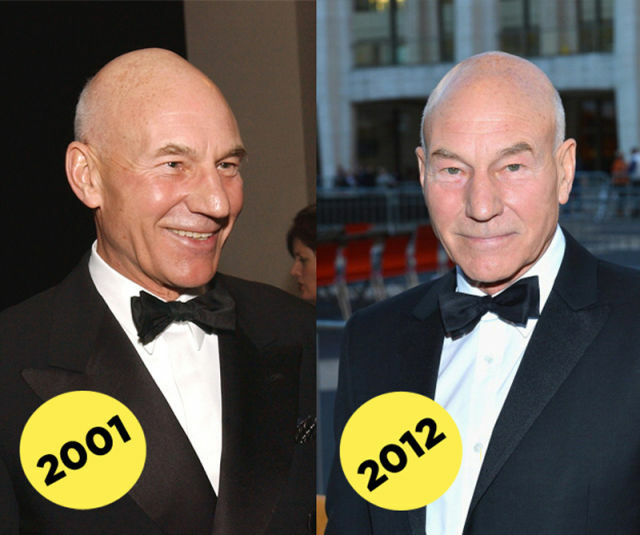 Patrick Stewart: Unstuck in time. A sin because I seem to be stuck in 2003. Still a newlywed, with my bachelor years full of insane roommates and imbalanced ex-girlfriend just recent history. I think I'm still 24, not nearing 34. I'm off by a decade. As Kurt Vonnegut says in Slaughterhouse Five, I seem to be "unstuck in time." My body knows I'm not 24 anymore. It reminds me daily. The athletic peak of the human body is said to happen at 28, and my softball skills would agree. I play for a team called the Aging Heroes. Irony? No--simply fact; although calling myself a "hero" is probably hyperbole. My role is more Aging Role-Player. I'm like a crafty veteran. 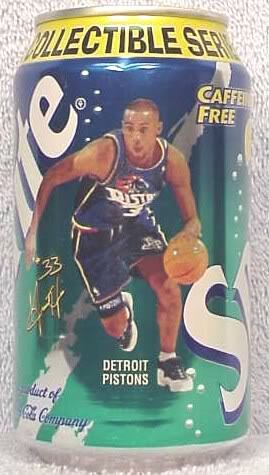 Grant Hill of today, and not when he was Sprite's demigod. I'd call it a pre-mid-life crisis, but it's not. Simply, the world has continued to revolve while the lives of many of my generation have come to a standstill. My career, my earnings, my future, are all still question-marks. Seven years ago I graduated from graduate school, and seven years later I haven't really progressed. I look at my house and it is like a museum to a more prosperous time. I'm not complaining. I have a flat-screen television...but I've had it for eight years (don't ask how much I paid for it back then). My leather couches are cracking all over the place. My wife's furniture is aging ungracefully. Eight years of Jack Russell Terrier and two small raccoons (my daughters) have taken a toll on our materialism. My wife and I, ten years from now. Still rockin' the Wii. And now I look around, and see that my once proud possessions are almost worthless. Almost everything in the house needs updating. The Joneses have moved three times, and I don't get updates, because I can't afford their housewarming gifts. I can't keep up with progress. I still own a Wii; which sends its ugly 480i transmission to my HD television...and I'm repulsed by its VCR-ishness. I used to be someone. I used to be a contender. But now I'm nothing. Now I'm a bum. 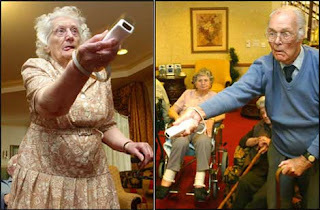 A bum with a Wii. Oh, I'm sorry, that's just the feel sorry for myself mentality that is so engrained in every American. Other people got it good...why can't I? Every once in a while, I forget about my blessings and go back to that complaining DNA that resides in all of us. Is this what life was supposed to be like? My God, my God, why have you forsaken me? Poppycock. Hogwash. Horseradish. Balderdash. Tomfoolery. Lies. It's all lies. Yes times are still rough. I sometimes wonder where I've been for a decade. A hiatus? Waiting it out on the doldrums? Where are the trade winds that will bring a financial windfall? Isn't the economy recovering? Shouldn't I be moving on up, to the East Side? I don't know what the future holds and I don't know where I'll be in five years, or if I'll still be teaching or blogging or whatever. But I know I want to be more content. I want to age gracefully and not live in constant stress. I want to surround myself in familial love and not material possessions. Because frankly, the way I'm living now is going to kill me. Because all that stuff is going to the junk heap eventually. I don't want to go with it. My wife and I will celebrate a decade married in July. It's been a joyous ten years, even if it hasn't been a professionally successful decade. When I wonder where the years have gone, I remember, "Oh yeah: I married the love of my life, and family became my top priority. So what if our kids and dog have destroyed the furniture and stained the carpet. We did this, together. That's what we've been doing for a decade. Wearing in, not wearing out." Oh, how I relate to this! Like, every bit. I too am stuck in 2003, with all possibilities ahead of me. "I look at my house and it is like a museum to a more prosperous time" - I wrote one of my first blog posts about that(http://wp.me/p2Js7k-X). I like to measure myself by professional success, of which I have none, but I forget the personal successes - my marriage, my sobriety, dealing with mental illness, my relationships. Loved this post. Thanks. It was hard to write. It's hard to realize I'm grateful despite the world not accepting me financially. I read much of your backlog when I found your site, but I'll go back and re-read that entry. "Wearing in, not wearing out." I like that thought. And I like that fact that after looking at all the things that are "wearing out"...you come back to what is really important. I need to keep that in mind. Some of the stuff in my house which I used to be quite proud of, has aged into junk. I know what I paid, and now, it is just old. But my family keeps refining with time. Like good wine. My wife made note that we needed a new kitchen table because our current one is scratched all to hell. I told her: no way. Kitchen table scratches are a sign that there is activity at it. Memories are made with kitchen table scratches. Hang in boss. All that's shiny eventually fades. All that's real never does. We bought a Pine breakfast nook from Fred Meyer (Krogers), and after a few days I realized the wood was so soft that the kid's homework has etched into it. Scratches, spelling lists, hieroglyphics, are all faintly embedded into the surface. It will serve it's purpose...then I might display it on the wall when the girls are older. But no more Pine tables for me. I love that last line! Although I've yet to have kids to help wear my life in, I still want to keep your phrase in mind. I, too, am eerily stuck in 2003. No matter how many years go by, that year always feels like it was just yesterday. That was the year I graduated with my Bachelor's, the summer I spent traveling up and down the Midwest and across the country teaching peace and justice to my larger church body's youth, it's when I got my first apartment, and the year I began the most harmful relationship of my life. Sometime I wonder if it's because I want to go back and relive those good times, and maybe change my boy kissing choices? But I do have a lot of good stuff going for me in the present, and I really need to focus on that. Thank you for letting me relive the past with you, but also help ground me back in reality. Wow, your "harmful relationship" happened roughly around the same physical age as mine (mine in 1999, though), while I was deeply involved in a youth ministry. It's pretty much the concept of my unpublished novel. It would be interesting to see how closely our experiences match. Once your novel's done, I bet I'll be able to relate to a lot of it. Crazy that it happened to us around the same age and with similar life experiences going on. Some days I feel 60. Or I could just hang out with my folks. They have thousands of stories (as did that whole generation)...that's how I learned to tell my own. I was just having this conversation with my Dad recently. I think that, as kids and teens, we are always focused on the next year up, the next stage, and everything seems to take forever to happen. Then at some point in our early 20's, we stop worrying about growing up (because look! we've done it!) and simultaneously become heavily distracted by whatever our day-to-day lives are occupied with. All of a sudden, time moves very quickly, often unnoticed, and we are startled when the passage of years is brought sharply into focus. It happened to me when someone mentioned my cousin's upcoming birthday, to which I replied, "No, that can't be right, because she's ten years older than me and I'm only...Oh." Yes...grown up. And the years fly by.